Another Samsung promotion just started. In order to put more Gear VR headsets to people heads Samsung will include free Gear VR with all sales of latest Galaxy smartphone devices. Included devices: Galaxy S7, S7 Edge, S6, S6 Edge and Edge+, and Galaxy Note 5. They where so generous and also included 6 Oculus games. Obviously Samsung has great confidence in Galaxy devices and want to get a large number of people into a VR movement. For Samsung Galaxy smartphone users Gear VR is shortcut to Virtual Reality and must have accessory. That is why this promo deal looks pretty appealing. 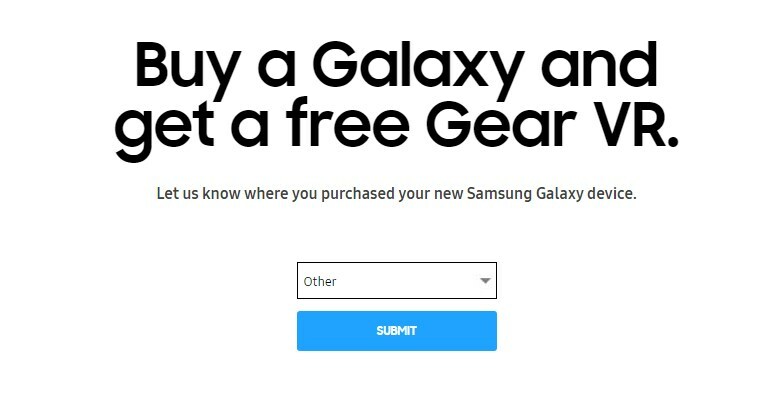 To claim your free Samsung Gear VR you have to buy one of above mentioned Galaxy smartphones (under the assumption that they need a new phone) with one of following suppliers (Verizon, Best Buy, T-Mobile…) and then register for the promotion at Samsung‘s website. Offer ends on June 19th.